Activate only if both a “Gravekeeper’s” monster and “Necrovalley” are on the field. Neither player can Special Summon monsters, except “Gravekeeper’s” monsters. 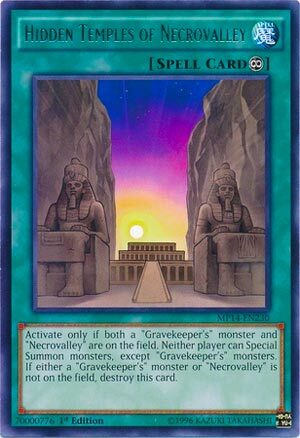 If either a “Gravekeeper’s” monster or “Necrovalley” is not on the field, destroy this card. Hidden Temples of Necrovalley is a fantastic archetype card, but it could’ve had a little something more. Shutdown Continuous Spell for Gravekeeper’s to use against virtually any deck in the game, Hidden Temple prevents any Special Summons except Gravekeeper’s…as long as a Gravekeeper monster or Necrovalley is on the field. Needing both on the field to activate this card is a requirement I think the archetype can make happen pretty easy, considering some cards are considered “Necrovalley” within the archetype. The main concern I have is the lack of protection this card has against the elements. It doesn’t have a “once per turn” protection ability built-in, it just sits on the field and you hope it will be alright. Sure, put a Gravekeeper out there with Necrovalley and this and maybe a spell/trap in the backrow, and you are all sorted. You stopped Special Summons, you have a likely 2000ATK monster, and you are holding down the graveyard…but that isn’t always going to be the opening hand. This card is great at helping Gravekeepers do what they do best: control the flow of the game. If you open with this card and its requirements, there are some decks that are going to be put against the wall immediately. Keep a Keeper on the field or Necrovalley and you are slowing the game down a lot. Happy Thanksgiving Throwback Thursday! Hidden Temples of Necrovalley is a free Continuous Spell Card that locks both players into only Special Summoning Gravekeeper’s monsters. However, in order to activate and maintain this card on the field, you need Necrovalley and a Gravekeeper’s monster on the field. It’s an excellent archetypal lock out card that works perfectly with yesterday’s card. Since it is searchable, run maybe 1 or 2. 3 could backfire, but then again you can have more than one on the field at a time. I hope this deck does well again. Score: 4/5 Art: 4/5 Maybe the temple only appears with the setting/rising sun? I did mention yesterday that Gravekeeper’s had their own Vanity’s Emptiness, and here it is, Hidden Temples of Necrovalley. Hidden Temples of Necrovalley is a Continuous Spell card that can only be activated while you control a Gravekeeper’s monster and Necrovalley, which is easy in the archetype and Supernaturalist will be protecting itself and Necrovalley. While this card is on the field, neither player can Special Summon monsters except for Gravekeeper’s monsters. Well, you are playing this in Gravekeeper’s, so it is nice that it doesn’t lock the archetype out of Special Summoning, but locking your opponent out of doing such, unless you somehow run into a Gravekeeper’s mirror match, is great. I mean, Vanity’s Emptiness and Royal Oppression are banned for a reason, Special Summoning is key in this game now. The card is balanced some more as if you don’t control either a Gravekeeper’s monster or Necrovalley, this card is destroyed. So it lives off you keeping your monsters and Necrovalley, which is fine. The card is good in Gravekeeper’s and is now searchable, so you will likely run this in your Gravekeeper’s deck. Art: 4/5 What’s in the tomb? Happy Thanksgiving!!! I figured for Throwback Thursday a Gravekeeper card was appropriate after looking at one yesterday. This also takes a page from my book where this card isn’t one we’ve looked at before, but I still felt was old enough to be a Throwback. Hidden Temples of Necrovalley is a Continuous Magic card, and a simple but certainly useful card for a Gravekeeper players. You can only activate this Magic card if Necrovalley AND a Gravekeeper Monster are on the Field. (Note, for what it’s worth, it doesn’t say on your Field, so that’s something I suppose). This card shuts down Special Summons for both players, outside of theme specific. So, in short, if it’s not a Gravekeeper, neither player is going to be able to perform a Special Summon. That can be absolutely crippling. The big catch here is that if there isn’t a Gravekeeper on the Field, or Necrovalley (odd as you need both to activate this card, but cool that you need less to maintain it) Hidden Temples is destroyed. This does combo well with the Supernaturalist we looked at yesterday with the protection the card offers. It’s not necessarily a focal piece, but I think it can be a welcome usable piece for Gravekeeper players.